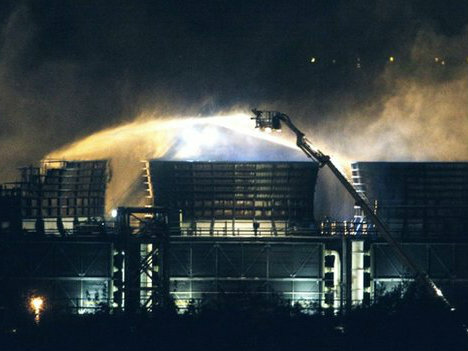 An investigation is under way after a large fire at one of Britain’s most important power stations. At its height, around 100 firefighters were called to tackle the blaze, which broke out at around 8pm last night. The BBC reports that the station had to be partially shut down, however authorities have denied there will be any disruption to energy supplies, with Energy Secretary Ed Davy saying that the National Grid had assured him there is no risk of outages. Dave Bray, the fire service’s incident commander, said that the fire has now been extinguished: “We have extinguished the fire, although there are hot spots that are remaining within the structure. Didcot B provides around 1.3GW of electricity to Britain, enough to power a million homes. One of its two modules has now been shut down as a safety precaution, although the fire mainly took place in a cooling tower. Npower spokesman Dan Meredith said: “There will be no disruptions to electricity. However, energy analyst Peter Atherton told the Telegraph that the risk of blackouts this winter was now higher thanks to the incident. “The loss of 1 unit at Didcot B reduces the UK’s already meagre capacity to absorb supply shocks for this winter,” he said. “Advanced economies view interruptions to power supply as unacceptable. Therefore they typically operate with a great deal of spare capacity allowing them to absorb a substantial number of unexpected events – say 10. “However, going into this winter, UK energy policy had reduced our ability to absorb unexpected events substantially (to say 4). “Unfortunately, the UK has now seen three unexpected events before the clock change. Another one or two could cause a serious security of supply event, and a probable surge in wholesale prices.